The oddball realm is filled with many fantastic things. There are Dirigibles (flying airships) manned by magic-powered robots, humanoids animals of all variety, terrifying beasts, and sea-monsters among other things. These airships can be seen flying over the Middle Seas battling pirates for its many treasures. Take command of your own Dirigible and find adventure in this wondrous realm. Update: The Kickstarter campaign is now live, go check it out! oddball Aeronauts is a light and quick playing 2-player card game in which the players go head-to-head in a tactical battle of mighty airships. Start the game by choosing your side in the fight: the Pendragon and their airship “Hunter” or the Pirates’ “Wave-Rider”. 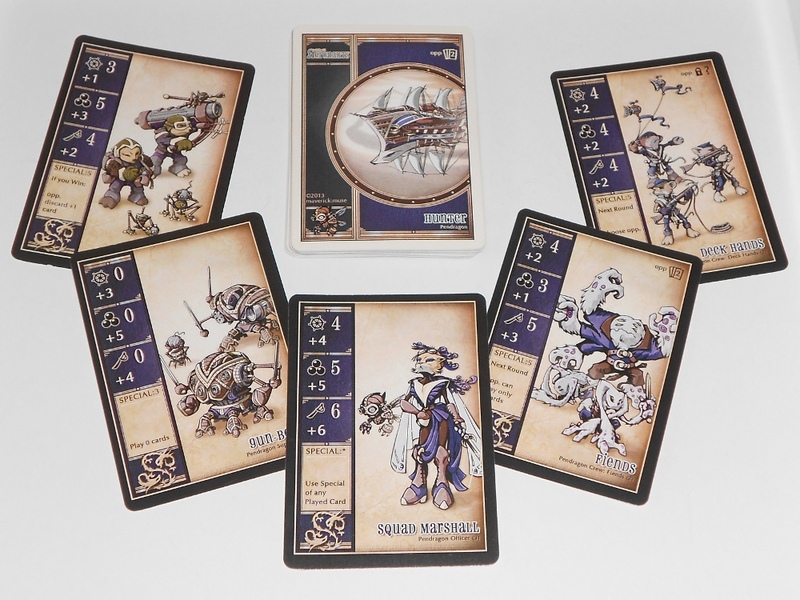 Both sides have a distinct 24 card deck made up of several crew, officers, and support robots along with a mighty captain and figurehead. Each faction has their own strengths that make playing with them a unique experience. Take the deck of your selected faction, shuffle the cards, and place it face up in your hand. You’ll be holding on to this deck for the entire game, no playing surface necessary! One player adds some Event cards face down into their deck which will introduce twists and challenges during the game. Since your deck is face up you’ll be able to look through it freely but you’ll mostly care about your top three cards. It will help to fan these cards so that you can see them at a glance. You’re now ready to engage in your first battle. You’ll be holding your cards like this most of the time. The goal of the game is to force your opponent to discard their entire deck before you do. When a card is discarded it is flipped over and moved to the back of your deck. You can easily tell which cards have been discarded because they will have their back showing. Each round will have a skirmish where the players attempt to outmaneuver and flank each other by using one of three skills: Sailing, Guns, and Boarding. Starting with the leading player each side announces one of those skills to use in the current round. Once both sides have decided on a skill they will simultaneously decide which of their top three cards they wish to bring into battle. The top card always participates but either or both of the two underneath it may join in as well. The cards are then revealed and you add the Skill Level (Large number) of the top card together with the Skill Bonus (Smaller number with a plus sign) from the supporting cards to determine your total. The higher value wins the round and triggers a result based on the skill they used. Sailing allows you to Recover 2 cards, Guns forces your opponent to Discard 2, and Boarding does 1 of each. When Recovering you will flip your topmost discarded card back to its active side, allowing it be used again later in the round. After each battle the cards that participated are discarded along with any that were the casualty of Guns or Boarding. All cards also have a special Trick, or power, that can enhance their strength in battle or perform some special ability. Tricks range from recovering or discarding additional cards to rearranging your cards or messing with your opponent in the coming round. Only the top card can use their Trick so you’ll have to make sure that the right cards get to the top to take full advantage of their abilities. Events represent challenges and blessing that players will face during the game. The winner of each round becomes the new leading player in the next and you’ll continue taking turns this way until one player has discarded their entire deck. If the other player still has at least one active card then they are declared the winner. Shuffle your cards or switch decks to play once more, it’s so quick that you know you’ll have to try again! Soaring High or Crashing Down? I was lucky enough to get a previewer prototype version of oddball Aeronauts so my thoughts are based on this copy of the game. There are a number of improvements that are planned for the official release and I’ll try to cover those aspects where applicable. oddball Aeronauts has several aspects that when combine put it in a relatively unique category: the ultra portable strategic filler. Let’s run through that description to see what distinguishes it. To begin with it is a super quick 2-player game that fits nicely into the filler category. Most of my fillers of choice don’t scale well down to 2 players or end up closer to 30 minutes in length. oddball Aeronauts’ fast play time and simple ruleset give it the accessibility that all good fillers need. It not only clocks in under 15 minutes with rules explanation but is specifically designed for two. There are planned variants to accompany 3-4 players which I will be eager to try out. If the lightning fast play time can carry over to more players then it will easily challenge my established favorite fillers. Next up we have oddball Aeronauts’ big selling point, portability. Not only can it easily be carried around in your pocket but you can play it nearly anywhere that you have a willing opponent. The concept of holding your deck in hand for the entire game removes the need for a playing surface and comfortable sitting position. This isn’t just a novelty to distinguish the game, it is a practical design choice to make the game play smoothly. You can look through your deck at any point simply by fanning it out. The deck itself is small enough that you’ll have no problem holding on to it and easily moving cards around when you Discard or Recover. This is perhaps the ultimate travel game, easy to store and great for pulling out when you’re waiting around. I’m planning for it to be an essential traveling companion from now on. The fantastic artwork also helps to further enhance the game’s accessibility. oddball Aeronauts is part of a charming universe that is populated with plenty of interesting characters. The cards do a great job of highlighting the different personalities, bringing them to life with the vibrant art and playful names. There are even stories for some of the characters on the website, hopefully some of them will be included with the official release. It’s a great entry point into the oddball universe which has plenty more to explore. The Pirate faction – scary and cute! Games that are this short can often times sacrifice strategy to create an exciting and quick experience. 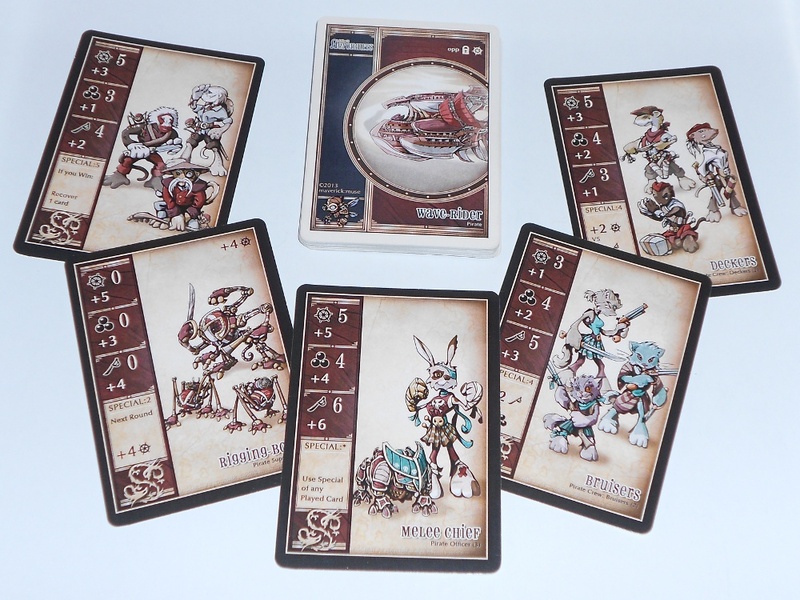 I’ve heard oddball Aeronauts get compared to War, that card game activity from your childhood. I don’t really find it fair to draw that comparison as oddball Aeronauts is much more than War with strategy. The parallel is fitting for the rush of excitement that you get with every reveal, anxiously waiting to see who wins that round of combat. 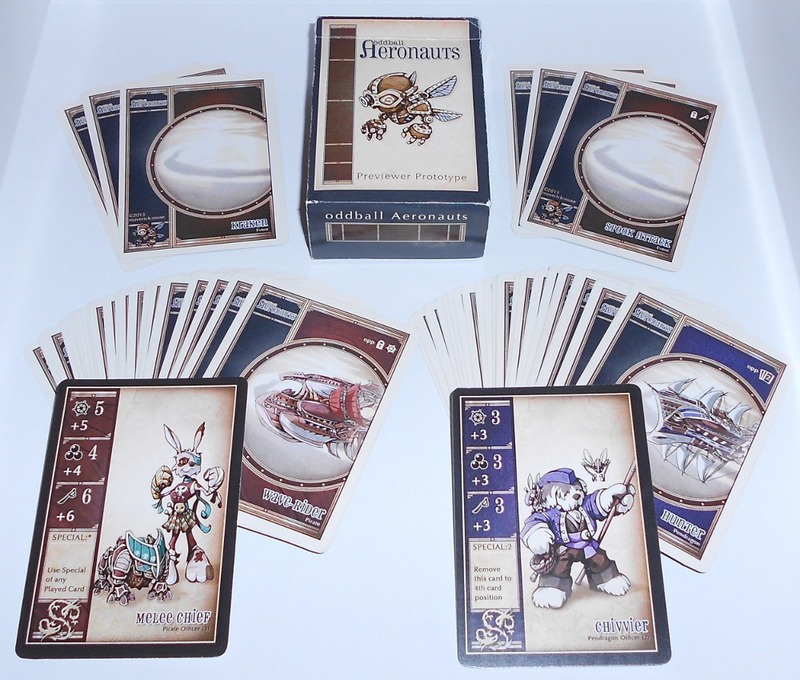 But where War is predetermined and completely removes any sense of control oddball Aeronauts provides a wealth of decisions for the quick playtime. At first glance it might appear that the bulk of your strategy will revolve around determining which skills to call and cards to select in order to maximize your attack value. If you can have the higher value more often then it will give you an edge both in recovering your own cards and making your opponent discard theirs. If this was the case then I wouldn’t think so highly of oddball Aeronauts because it wouldn’t be much more than a quick playing War variation with a tacked on guessing element. Luckily there are more nuanced decisions to be made during the game that will be revealed during your initial plays. We’ll start off with a fairly simple decision, the number of cards that you are going to use. You might think that your immediate goal should be to win each round, thus allowing you to trigger the win results. However what you are really trying to do during the game is go through your deck more slowly than your opponent. Winning is helpful for this but it’s realistic to assume that you aren’t going to win when you have a weak hand. Knowing this can make a big difference in picking your loses carefully. You want to ensure that when your opponent wins they are getting as little benefit from it as possible. Since all cards used during each battle are discarded if your opponent wins using 3 cards and you only use 1 then you will break even in that round as a win result nets 2 cards. For instance, if they selected Guns then you will both end up discarding 3 cards in total. Minimizing your losses goes a long way towards maintaining a slower tempo through your deck. Along those same lines it can be just as helpful to win using only 2 cards instead of 3. It can be tempting to go all-in to ensure a win but knowing when to hold back can make a big difference. It can be somewhat shortsighted to focus only on maximizing the results of the current round. You are playing with your entire deck visible so you are allowed (and encouraged) to look ahead and plan for future turns. 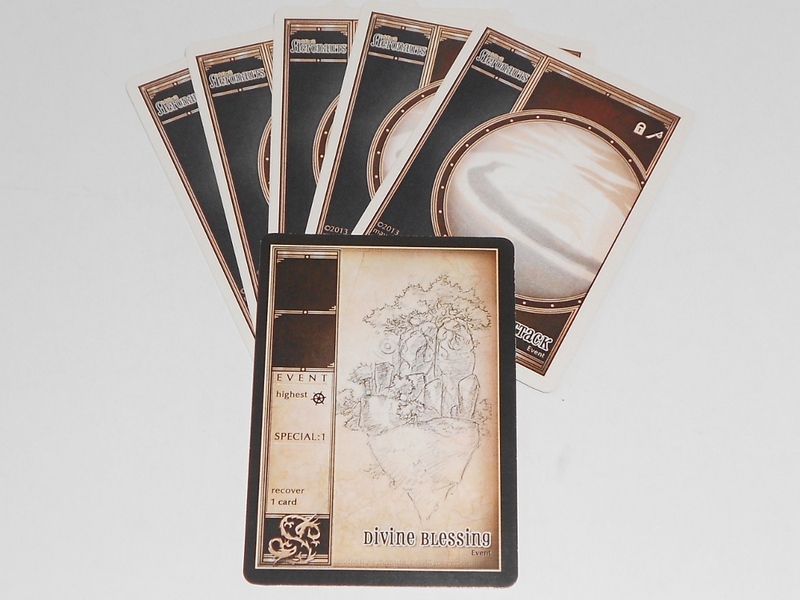 It is incredibly important to get the right cards on top to allow you to utilize their higher Skill Level and Tricks. 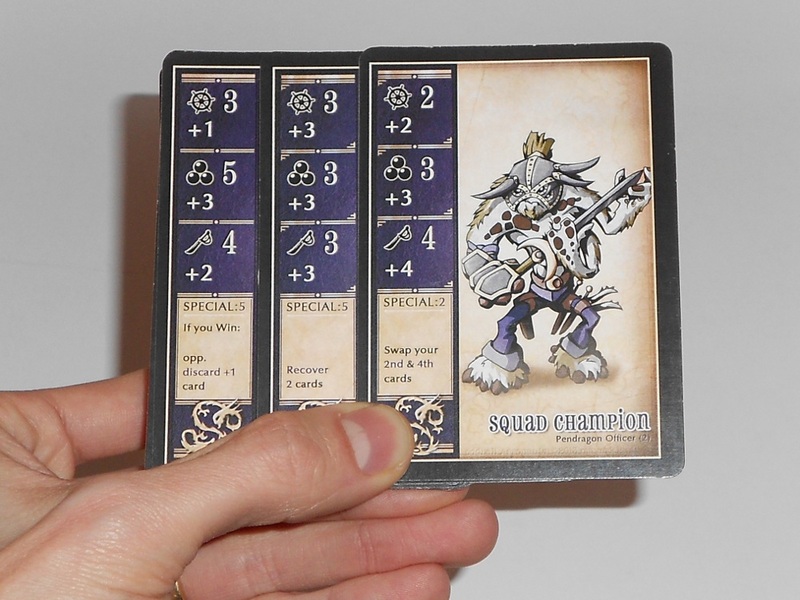 You also want to set up good supporting cards that have complementary skills where possible. Fortunately your opponent will announce which Skill they are using before you select your cards. You can use that information to assess which cards will end up getting discarded if they win and ensure that you can plan accordingly to get the right ones to the top. As you play more you’ll start to shift your focus from trying to win the current round to manipulating your deck so that you can play (and win rounds) more efficiently. Tricks represent a significant factor in this regard, you want to get the right ones on top of your deck when you can make best use of their abilities. An example are Tricks that provide an attack bonus when your opponent calls a certain skill. These are best used when you are announcing your skill second which means that you lost the previous round. You probably won’t intentionally set them up in the top position but they can be a great backup for when you lose and and are forced to discard the top card you had planned on using. 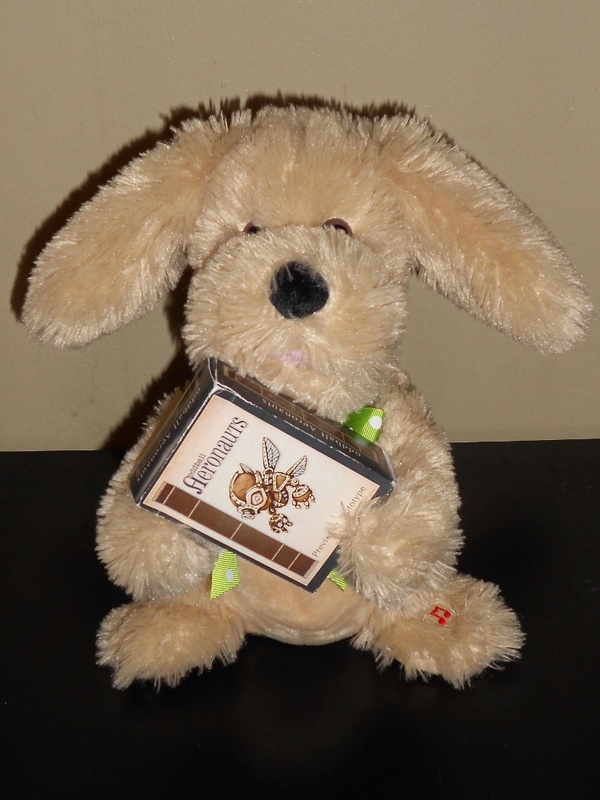 The Pendragon faction – uppity and cute! I’m not trying to say that oddball Aeronauts is an incredibly deep game. Rather, I am saying that the depth is excellent for the length of the game. Players are presented with enough tough decisions to keep them engaged throughout the game. It’s quick moving and better off for not overwhelming the players with options to maintain a steady pace. Your choices are limited but meaningful and allow for control over the current and coming rounds. If you are looking to add even more tactical choices to the game then the “Master Pilot” variant adds in some subtle changes to the Win Effects. Sailing gives better deck manipulating, Guns lets you win without the burden of leading, and Boarding now steals your opponents top card for a one time use. Not only do they give the winner more interesting rewards but they give you another thing to consider when you’re faced with the proposition of losing. Boarding’s new ability to Capture a card has a significantly different feeling from the old recover 1, discard 1 power. You must now decide which card you’d be willing to feed to your opponent but still be happy to have as your top card if you win. I really like the added tactics that this variant adds to the game and prefer to use it once my opponent is familiar enough with playing. The full release also includes “deck-crafting” cards which will let you swap out cards before the match to tweak your deck. This should help to add more variation to the game by letting the factions play out differently depending on the mix of cards being used. It will also let you tailor your deck to emphasize and try out different strategies. This will provide some nice decisions to be made before the game begins without adding much length. Looking past the release, oddball Aeronauts has a lot of potential for expansion. Not only could more cards and events be added in the same vein of deck-crafting but entirely new factions could be introduced. With the inclusion of rules for more players you could have 3 or 4 players using completely unique decks. The team rules for 4 players in particular could have some really neat interaction depending on which factions are paired together. Fortunately adding more decks won’t add much more need for storage and the game should remain just as portable as ever. oddball Aeornauts is a light, quick, and fun card game that is perfect for 2 players on the go. Make sure to save room in your pocket and check out their Kickstarter campaign which ends on March 3.